Super Savings Item! Free Shipping Included! 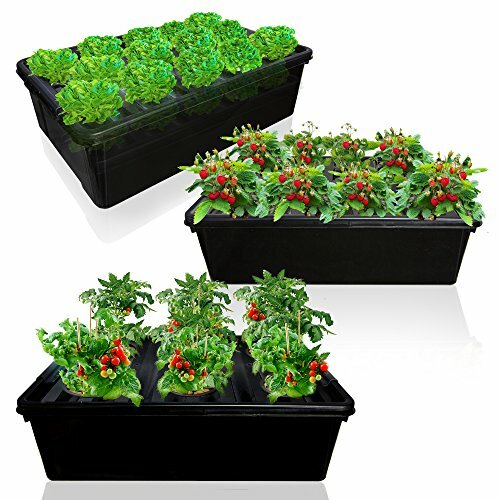 Save 31% on the DWC Hydroponics System Growing Bundle - 3 Big Bucket with Air Pump, Large Airstones, up to 28 Plants - Complete Hydroponic Setup for Indoor Herbs, Seeds, Seedlings – by SavvyGrow (3 In 1 Bundle) by SavvyGrow at Tulips Orchids. Hurry! Limited time offer. Offer valid only while supplies last. Ever wanted fresh herbs & salads but you don't have a garden, or your soil is too poor? The SavvyGrowDWC Hydroponic System lets you do it indoors. DWC Hydroponic System lets you do it indoors. Click ADD TO CART now to grow big plants, fast n easy. possible. Our 2 x large airstones & pump, oxygenate water so plants will never be overwatered. CAN YOU START PLANTS FROM SEED? the sites (holes) to allow the plant to flourish as it would naturally. asked. Click Add to Cart now to grow big plants, fast n easy. ✔ FRESH & GOOD FOR YA... get full-power health benefits from your homegrown food; it keeps its vitamins, tastes better & unlike shop veg, hasn't travelled far. Go organic & show folks the way! ✔ BIG RESERVOIR MEANS BIG PLANTS... grow 6 together from seeds or seedling; place basil by tomato, lettuce with paprika, then add water & root supplement, now watch them grow! If you have any questions about this product by SavvyGrow, contact us by completing and submitting the form below. If you are looking for a specif part number, please include it with your message.